Follow any prompts and you’re done! You will need an active license before it will work though. Click here to register and get a license. WebCP, short for “Web Hosting Control Panel”, is a web based web hosting control panel. Its designed to be easy to use, intuitive and quick to learn. To get WebCP, web hosting control panel you need to register an account. Registration is free and does NOT require you to link a credit card or any payment method. Once registered you will use the installer script on a newly installed Ubuntu 16.04 server. This will install WebCP. We have a nifty invoicing policy. You’re only billed at the end of the next month. So, if you install your license on the 1st of August for instance, your first bill will only be due on the 28th of September. That effectively gives you a free two month trial. And as mentioned, you don’t need to add any billing information to get this trial, so its completely safe for you! Once you’ve decided you’re happy with WebCP, simply log into your account, click on the “Invoices” tab and do a credit card, paypal or EFT payment to continue using your license. REMEMBER: WebCP uses the freemium model so you’ll get a fully featured license for free if you host less than 5 websites. As a business in South Africa we needed to protect ourselves from rising costs due to a weaking rand. We wanted a control panel which didn’t confuse our clients, after all, not many of them are technically savvy! At first it was our intention to keep WebCP all to ourselves. However after using it in our shared web hosting environment with positive feedback we extended its use to our VPS and reseller accounts. Eventually we decided to release it as a product in its own right. Script installation of WebCP web hosting control panel using our simple installer script is an absolute breeze. Newly installed minimalist version of Ubuntu 16.04. If you’ve met the above requirements you’re ready to install WebCP web hosting control panel! 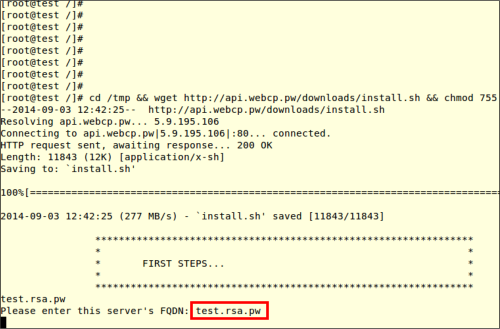 The installation script will first ask you for the server’s FQDN. It will attempt to guess the correct name. If it is correct you can simply press enter, otherwise correct it and the press enter to continue. Next, the installation script will ask you to create a new user. This is because for security reasons root access to SSH is blocked by WebCP servers, so we create an unprivileged user account which you can SSH into and then su if needed. Enter a new user name and then enter the password twice to create a new user account. Once that’s been done you’ll see a message that the installation is starting. The installation will run through and once done you will get a message that the installation is complete. The installation complete message also has info on how to access your server. 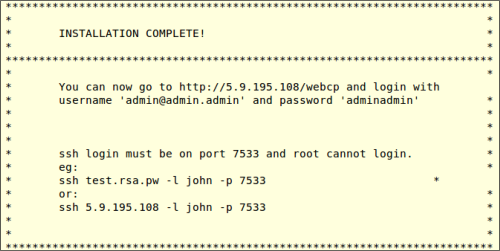 To access your server by SSH, ssh into your server on port 7533 using the user account you created in step 1 above. WebCP’s ready to use VPS is the quickest and easiest method of using WebCP Web Hosting Control Panel! If you can’t install WebCP for whatever reason, or you simply want the easiest way of getting it, you have the option of getting a ready to use VPS server from us. Simply contact us and ask us how. You can be up and running within minutes. OpenVZ Template installation is easy! If you have access to an OpenVZ hardware node and you have the option of installing an OpenVZ template, you’re ready to run out of the box. If you’ve met the above requirements you’re ready to install WebCP web hosting control panel. Simply contact us and we’ll send you a download link to an OpenVZ OS template to download.